Angelita daisy is a beautiful, small perennial that is a reliable producer of yellow daisy-like flowers throughout the year. The heaviest blooms occur in winter and spring, which makes this little plant an asset to the landscape. They grow to approximately 10″ high and up to 18″ wide. 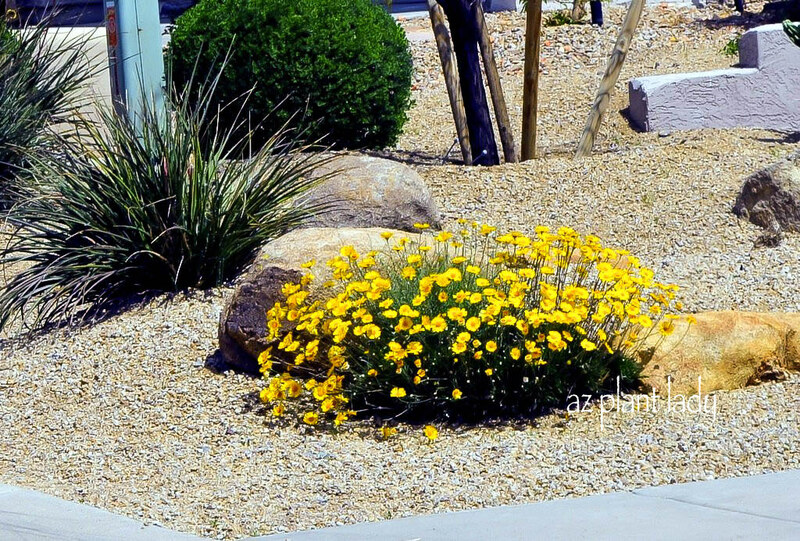 Plant angelita daisy in full sun for best appearance and in well-drained soils. Add compost to the planting hole so that resulting mixture is 1 part native soil to 1 part compost. Periodic pruning of the flowers helps to promote additional flowering. No supplemental fertilizer is needed. I have used angelita daisy many times in landscapes that I have managed, and they are very low-maintenance. They are among my top ten favorite plants and I use them often when designing new landscape areas. Angelita looks best when planted in groups of 3 – 5. Their yellow color accent purple and red flowering plants. They especially look nice when planted next to boulders in the landscape.